The first step to pest control is staying vigilant and knowing how to tell if and when you have a pest problem. Although most pests are good at hiding, there are a number of ways to tell whether your home is infested. Read on to learn about what signs to look out for and how these pests might be getting into your home. Finding insect and rodent droppings around your home is a clear sign that you have a pest problem. If you see black pellet-like droppings, you may have a rodent problem. These droppings are usually found near food cabinets and in places hidden from direct view. If you notice an out of place scattering of dark granules, you may be dealing with cockroaches, whose droppings resemble coffee granules. Investigating droppings can tell you a lot about the kind of pests you have, but be careful while handling them or cleaning them away. These droppings pose a serious health hazard. Rats and mice, as well as other big pests, make nests from easily available materials such as paper, leaves, and fabric. Finding shredded paper in your home is a clear sign of a rodent problem. Nests will often be found behind, under, or inside appliances, cabinets, ceilings, and other hidden areas. If you do come across a nest, leave it untouched so the pests don’t scatter away from it. Unusual sounds and smells are key indicators of pests. Squeaking, scurrying, scratching or gnawing sounds are signs of rodents or large insects. Certain unusual smells are also a sign that you have pests, and different pests give off different odours. Rodents have a musty, urine smell, while bedbugs are associated with a sweet and musty odour, and cockroaches have an oily smell similar to soy sauce. Damaged furniture, wires and other items are also signs of a pest infestation. 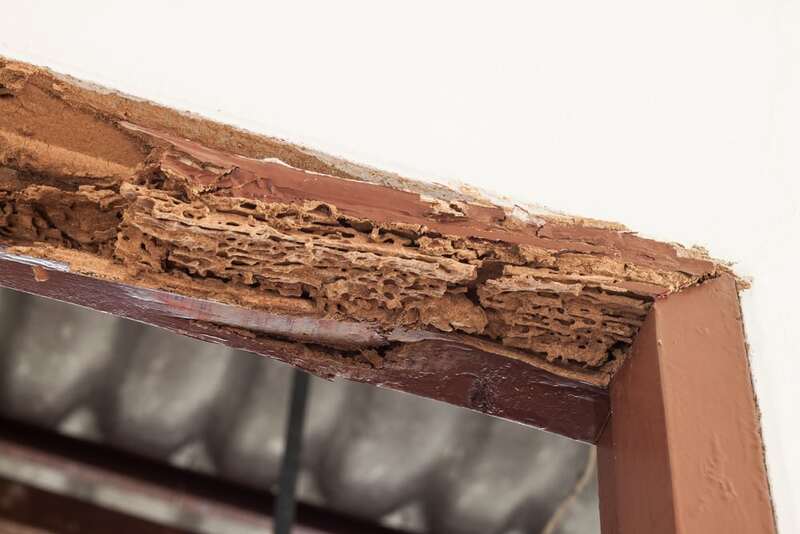 Mice and rats will often chew on wiring, food packages and furniture, while damaged timber or widening holes are signs of a termite infestation. Some other signs include reddish spots on mattresses left behind by bed bugs or bite marks after sleeping, greasy tracks left by rodents, lines of ants near baseboards and windowsills, and insect wings, mud tubes or tiny pellets near wood sources as a sign of termites. Where Did the Pests Come From? Pests are small and can get into your home in a number of different ways. Doors, windows, wall passages, dryer vents, exhaust fans, and house sidings are some common entryways. Pests can also come into your home attached to you, your family members, or your pets. Now that you know what signs to look out for, you can easily determine whether you have a pest problem in your home. If you notice any of the signs discussed above, call AGJ Pest Management and we’ll properly inspect your home to have it pest-free in no time!